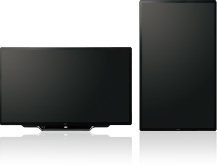 Sharp’s impressive lineup of BIG PAD touchscreen LCD monitors has a new addition—the PN-80TH5/70TH5. 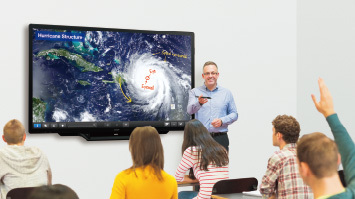 Content on the screen of this 80- or 70-inch model is extremely precise, realistic, and easy to make out, thanks to 4K Ultra-HD resolution and direct bonding of the LCD panel. 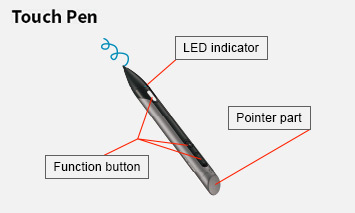 A bundled touch pen works with Sharp’s capacitive touch technology to provide a realistic “Pen-on-Paper” user experience. Writing on the screen feels fluid and natural. While the PN-80TH5/70TH5 is ideal for museums and libraries, where it really shines is in high-precision environments such as video and graphic design studios and research and architecture workspaces. This is your go-to monitor when you need true-to-life detail and superb interactivity. 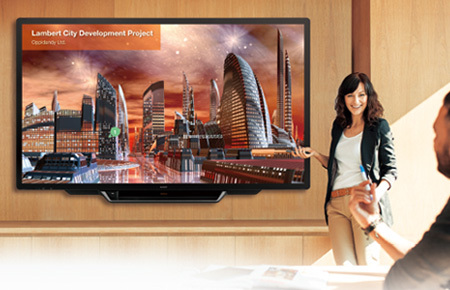 The PN-80TH5/70TH5 employs an LCD panel with 4K Ultra-HD (3,840 x 2,160-pixel) resolution. This large size LCD monitor with four times the resolution of full-HD renders the textures of videos and images and reproduces the finest details of small text and intricate graphics. Besides the obvious benefits for office and educational settings, the PN-80TH5/70TH5 practically engulfs the viewer in highly realistic sensations and detailed accuracy. It satisfies the needs of professionals in industries such as architecture and engineering, as well as in academic settings and creative sectors. 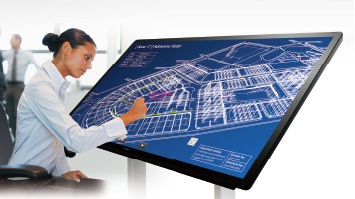 Sharp’s original capacitive touch technology gives the PN-80TH5/70TH5 highly sensitive touchscreen operation. It allows ultra-precise multiple touch inputs to be detected X and Y conductive grids etched onto layers of display. This achieves high sensitivity and precision by reducing the noise level to one-eighth of conventional models. Say goodbye to unintended input errors. You can operate and write on the screen as intended with touch pens or fingers, and gain maximum benefit from its superb performance. Thanks to direct bonding technology, the PN-80TH5/70TH5 provides a consistent and natural feeling when you write on the screen. The LCD panel is bonded directly to the protective glass layer, thereby eliminating the air gap between them. This minimises the parallax difference and reduces the reflection and refraction of light. As a result, onscreen touch and writing operations are smooth and the display looks natural and offers clear visibility. Keep everyone actively involved in the meeting or lesson by letting them write on the screen at the same time. The PN-80TH5/70TH5 recognises 30 touch points, allowing up to four people to use a touch pen or finger simultaneously to add their creative input when the inspiration strikes. Brainstorming sessions, meetings, and lessons become more lively and productive. Protecting the surface of the PN-80TH5/70TH5 is an anti-glare film that works to reduce glare and reflections and minimise fingerprint soiling. An expansion slot compatible with the Intel® Mini Open Pluggable Specification (Mini OPS) is ready to support the addition of an optional board providing greater convenience and an expanded range of functionality. An optional board slides into the slot on the back of the monitor. Up to 10 devices including Mac or Windows® computers, smartphones, and tablets can be connected wirelessly to the PN-80TH5/70TH5. Input from four devices can be displayed in a 2 x 2 split-screen. This board enables reception of HDMI™ video/audio and control signals sent via a single LAN cable from up to 100 metres away. Compatibility with HDBaseT 2.0 allows you to remotely operate a PC from a USB device connected to this board. The PN-80TH5/70TH5 is compatible with Sharp MFPs. Scanned documents can be directly imported to SHARP Pen Software from a compatible Sharp MFP. Onscreen image data, including handwriting, can be sent to a PC for storage or to an MFP for printing. 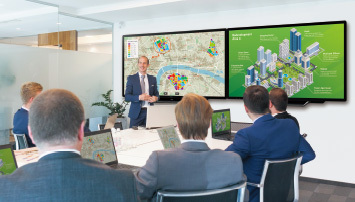 Compatibility with Crestron Connected software enables you to remotely control and manage each monitor via a LAN network. This pressure-sensitive pointer pen fits comfortably in your hand and provides outstanding ease of use. With its 2 mm-pen tip, it lets you draw thin lines or write fine text with high precision. 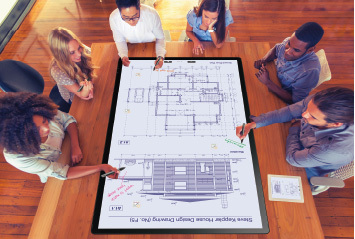 The pen works with the PN-80TH5/70TH5’s direct bonding and capacitive touch technologies to give you a virtual “Pen-on-Paper” user experience. A handy LED indicates your selected pen colour. And a customisable pointer function lets up to four people point out items on the screen and enjoy more interactive collaborations. This function prioritises pen recognition. It allows you to write with your palm resting on the screen, making it easy to write fine text or draw detailed graphics with excellent stability. The Touch OSD Menu is designed for easy and intuitive access to frequently used functions and settings such as brightness, contrast, language selection, backlight on/off, freeze/unfreeze screen, and more. 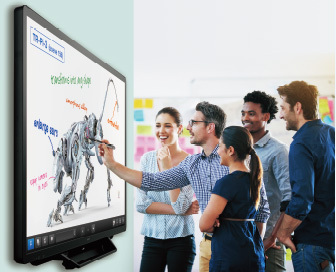 Up to three PN-80TH5/70TH5 units can be linked side by side to display sequential pages and deliver the impact of a multi-screen presentation—all with the stunning detail of 4K Ultra-HD resolution. The Multi-Board Function* is the ultimate tool for communicating complex information, for example, roadmaps and spreadsheets. * Only permits one unit to be touch-operated at a time. For simultaneous touch operation of all the linked units, please consult with your local authorised Sharp dealer or representative. The PN-80TH5/70TH5 can be installed in various orientations—landscape, portrait, or horizontal (face-up)—and at various angles* to match a diverse range of installation spaces or purposes. 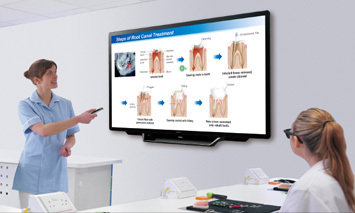 For example, face-up installation facilitates group discussions in an office or classroom where participants are looking down at the screen and writing simultaneously. Such versatility can change the way you communicate and encourages fresh ideas and innovation. * There are restrictions on the tiltable angles and other installation conditions. For details, please consult with your local authorised Sharp dealer or representative. You can display four screens in full-HD resolution simultaneously by simply connecting four PCs to the PN-80TH5/70TH5 via video cables. The display is switchable between single-screen and quad-screen. This function greatly facilitates productive interactions in the office or classroom. This software is a touch-operated onscreen user interface that lets you easily manipulate different types of files, including Microsoft® Office applications, videos, and web pages. The files are displayed onscreen as “sheets,” which can be stored in onscreen virtual “drawers.” This software brings convenience and originality to business meetings, in-store installations, and more. Note: Available via the downloader on the bundled CD-ROM. This software supports multifaceted wireless communication. 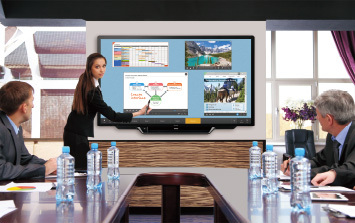 Content on the PN-80TH5/70TH5 screen, including handwritten notes, can be shared simultaneously with up to 50 devices. Also, files can be exchanged between devices connected to the PN-80TH5/70TH5. The PN-80TH5/70TH5 can play a powerful role in 4K interactive digital signage. This 4K Ultra-HD monitor makes content more appealing by delivering subtle texture and depth and by clearly rendering fine text and graphics. 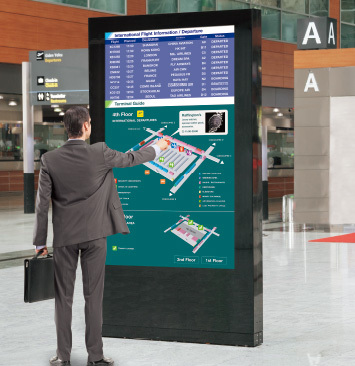 Sharp’s highly sensitive capacitive touch and direct bonding technologies create an outstanding interactive signage experience, with precise touch response and clear and natural visibility. In retail stores, malls, and showrooms, the PN-80TH5/70TH5 provides a sophisticated promotional platform. And in museums and libraries, it’s ideal for displaying digital archives. Because it can handle the demands of 24/7 operation, it also makes a superb signage solution in public areas. Sharp provides high-definition and high-precision solutions to satisfy the requirements of demanding interactive signage users.